Rhamnaceae, commonly known as the buckthorn family, is a relatively large family comprised of members not typically encountered in North American gardens. The numerous genera and species, predominantly trees and shrubs, are generally encountered in subtropical and tropical regions. Temperate-dwellers include Rhamnus, Ceanothus, Ziziphus, and Hovenia. 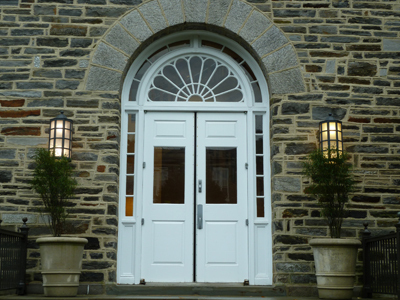 A pair of Rhamnus frangula Fine Line® flanks the rear entrance to Trotter Hall. The shrub’s exaggerated upright habit partners well with the stonework and emphasis on texture highlighted throughout the John W. Nason Garden. 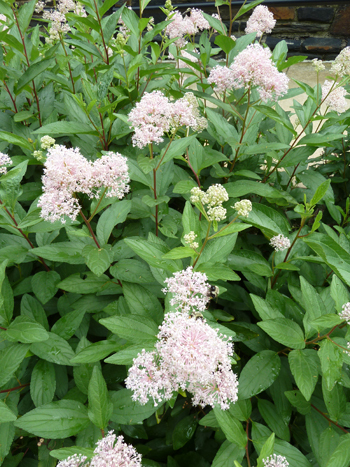 The plants are winter hardy and require little supplemental irrigation except during the driest stretches of the summer. I have long admired the Ceanothus. Often referred to as the west coast lilac or California lilac, Ceanothus are grown for the profusion of purple to blue lilac-like flowers. Sadly, most species require the unique climatic conditions of the west coast to thrive. 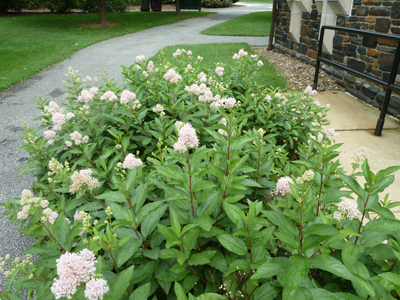 Several do grow in the Northeast, including Ceanothus x pallidus var. roseus. Pink flowers cover the terminal ends of the small shrub. It has proven to be a tough and highly adaptable plant, surviving an impromptu move across campus due to construction. Ziziphus jujuba ‘Li’ was offered for sale at the 2011 Scott Associates’ Plant Sale. Until the sale, the arboretum didn’t have this plant in the collection. Jujube or the Chinese date has been cultivated in China for over 4,000 years. Hundred of cultivars exist with Z. jujuba ‘Li’ being known for its large fruit and upright growing habit. The plant is celebrated for its ability to withstand a variety of growing conditions, including extreme summer heat. Michael Dirr writes the tree possesses a “concrete-like tenacity in heat.” While a period of cold is required to initiate flower buds, the requirement is so short that fruit is almost always guaranteed. Interestingly, the fruit from a single tree ripens over a period of weeks. The fruit is consumed fresh and found in a variety of other preparations including candied fruits and jujube syrup. Trees reach 20-25’ in height with two 25- to 30’ specimens near the south side of the U.S. Capitol. 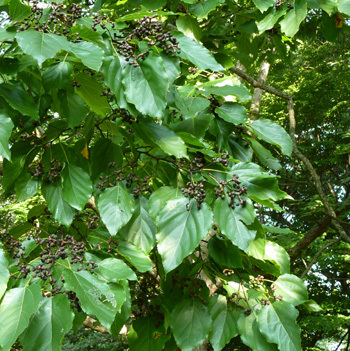 Ranging from Eastern China to Korea and the Himalayas, Hovenia dulcis, the oriental raisin tree, is perhaps the best-known Rhamnaceae member. The tree has been introduced throughout the world as an ornamental. In its native haunts, it is praised for its edible fruits, hard timber used in construction and for the creation of fine furniture, and its potential as a reforestation species. 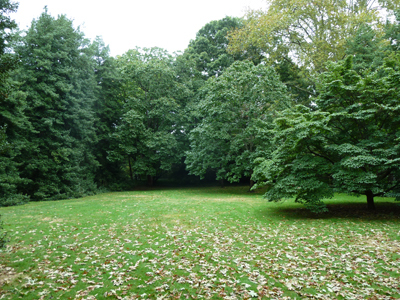 A grove of Hovenia dulcis inhabits an area adjacent to the Cherry Border. Of all its features, it is the striking bark that engages my eye. 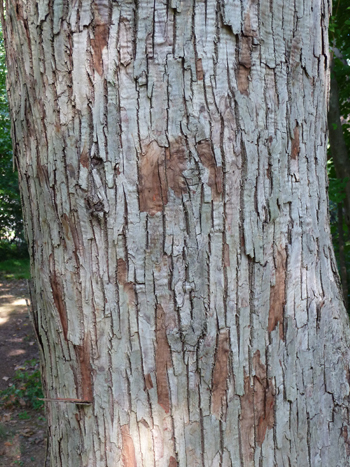 The gray bark develops rectangular plates with shallow, dark furrows. Plates drop to reveal a cinnamon-brown underside. The large, simple leaves are lustrous and clean – an indication that the species isn’t bothered by pest or disease. Flowers appear in June and July giving way to curious fruiting structures in September. Much of the literature for the species revolves around the edible fruit. The fleshy rachis is sweet and can be consumed raw or cooked. Dried fruits are said to taste like raisins. Extract from the seed and young leaves is used as a sugar substitute and for wine and candy making. Chemical compounds are currently being studied and show potential anti-inflammatory and anti-oxidant properties. In Thailand Hovenia dulcis shows promise as a reforestation species and is a candidate to replace Eucalyptus sp., a non-native plant imported to cover and reclaim bare ground. The tree grows quickly, a must for reforestation purposes, yet mingles well within a mixed planting allowing other species to regenerate nearby. Furthermore, the tree provides sustenance for birds and mammals. We have Hovenia in Exeter NH which was purchased at the Arnold Arboretum Plant sale around 1990. It is 19″ around the base (measured at about 5″ above the soil) in plenty of sun but it has not yet flowered. The soil is never given any type of fertilizer. Do you have any records as to when Hovenia flowers? I have been unable to find a specimen of this age. We have a specimen at the Scott Arboretum which we received as a seedling in 1942 from the Barnes Arboretum. It is large tree. For us, it blooms in May.